Top features: - Q Colour, Q Contrast and Q HDR for fantastic quality - Ambient mode means your TV looks good even when it's off - Near-invisible cable makes your home neater - Universal guide puts everything in one place - 360 ° design looks stunning Q Colour, Q Contrast and Q HDR Enjoy incredible images with the Samsung QE65Q8FNATXXU 65 Smart 4K Ultra HD HDR QLED TV. Q Colour helps to provide bold and vibrant colour, making movie nights better than ever before. It delivers 100% colour volume, with over a billion colours and shades so next time you're watching a nature documentary you'll see that savannah sunset in all its glory. Q Contrast brings the best out of your picture with deep blacks and bright whites. The screen keeps reflections to a minimum, so no matter what time of day or night you're bingeing on a box-set, you'll always be able to see your screen clearly. Film fans will love the richness Q HDR brings to this 4K UHD screen. HDR 1500 means you won't miss a single background clue hidden in the shadows of a twisty thriller. This TV and can even optimise each individual frame of a film so that every moment looks detailed and textured. Ambient mode Ambient mode lets the 65Q8F show decorative content, photos and useful information, or can even mimic the wall sitting behind it it'll blend into the background like chameleon. This TV looks great, even when you're not watching it It can play light background music too, adding a relaxing touch to your living room. Near-invisible cable Tired of TV cables getting in the way? The Q8FN's near-invisible cable helps cut down on clutter in your home. Using a single optical cable and One Connect Box for all of your connections, everything stays neatly hidden away. The One Connect Box connects all of your devices and inputs, like your Blu-ray player and games consoles. You can hide it out of view and control your devices using Bluetooth. Universal guide Not sure what to watch? Whether you love streaming the latest must-see shows or just want to watch the football highlights, the universal guide makes it easy to find exactly what you like to see. It can even make tailor made viewing recommendations just for you, so you won't have to scroll aimlessly through the channels ever again. 360° design Made using premium materials, this TVs has a minimalist design that looks stunning from every angle. The screen is the big feature here, which is why the Q8F has a clean back and almost bezel-less design. Effortless installation For setup without the squabbles, our Team Knowhow experts can connect your new TV to your Blu-ray player, sound bar, and other devices. They'll even get you online so you can put your feet up and start watching straight away. Essential extras Want your TV wall mounted? We've got brackets that tilt, swivel, or fix your TV in place for the best viewing spot in the house. Alternatively, browse our range of TV stands we've got enough designs to keep even the pickiest interior designer happy. Avoid the disappointment of getting your shiny new telly home and realising you don't have the cable you need to connect your games console or Blu-ray player. Sandstrom Gold Series HDMI cables support all resolutions and come with a reassuring lifetime guarantee. It will have varying results on complex wall designs, patterns, and/or unusual colours. 265 - 4K upscaling picture enhancement. Yes for Android / iOS. Music identification - Sports app. HDMI 2.0a x 4 - USB 2.0 x 3. TV PLUS - Freesat HD x 2. Satellite dish - WiFi router. Samsung QE65Q8FNATXXU 65 Smart 4K Ultra HD HDR QLED TV - Premium smart remote - Battery - Power cable - Slim gender cable - User manual - E-manual. TV: 827.9 x 1446.1 x 46.9 mm (H x W x D) - TV with stand: 920.7 x 1446.1 x 390.8 mm (H x W x D) - Boxed: 965 x 1617 x 192 mm (H x W x D). 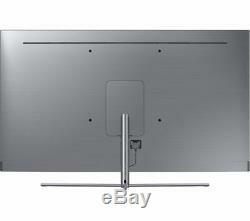 TV: 23.1 kg - TV with stand: 27.2 kg - Boxed: 38.85 kg. 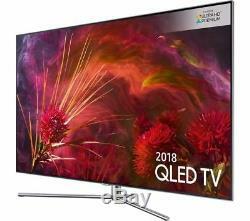 The item "SAMSUNG QE65Q8FNAT 65 Inch Smart 4K Ultra HD HDR QLED TV Brand NEW" is in sale since Saturday, July 21, 2018. This item is in the category "Sound & Vision\TVs". The seller is "brandrange" and is located in Birmingham, West Midlands. This item can be shipped to United Kingdom.